VALUELINE is a popular brand that offers a wide range of basic and most common products in the field of cableswith connectors for data transmission. Regardless of their attractive prices, VALUELINE products do not compromise on the quality of its cables, moreover they monitor and offer the latest technological developments on the market. The rich assortment of items of the brand is focused at all the customers who have no background in the field of electronics but still are looking for quick and practical solutions to problems arising in domestic sound, computer and TV systems. All products VALUELINE meet international quality standards and possess a RoHS certification. VIKIWAT Ltd. is a distributior and a wholesaler of a wide variety of VALUELINE's cables. In our store you can easily find an attractive range and in stock quantity of shielded and unshielded cables, power cords, extension cords, transient audio cables, LAN cable CROSS, HDMI cables, video cables, optical cables, cables with plugs and connectors, transient cinch cables, Internet cables, adapters, male stereo jack and female connector and stereo jack, as well as many other products with low prices and fast delivery. 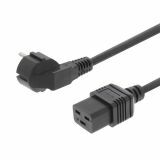 Power Cord, VLEP10300B20, Valueline, 3x1mm2, 2m, Schuko 90° angled, black, PVC Power cable VLEP10300B20 from Valueline designed for UPS with Schuko plug and IEC-320-C19 connector, load capacity 10A / 250 VAC, PVC insulation, 2m cable lenght and black color. Power cord, VLEP11042B20, Valueline, 2x0.75mm2, euro connector - IEC-320-C7, 2m, black, PVC Spiral power cable VLEP11042B20 from Valueline with european plug (schuko) and connector IEC-320-C7, section 2x0.75mm2, length 2m and black color. This type power cord with euro connector is suitable for connecting mains-powered devices to a power wall socket. Power cord, PCGP11055BK20, Valueline, 2x0.75mm2, 2m, angled euro connector- IEC-320-C7, black, PVC Power cable PCGP11055BK20 from Valueline with European plug and connector IEC-320-C7, section 2x0.75 mm2, length 2 m and black color. This power cable is suitable for connecting mains-powered devices to a power wall socket. Especially convenient on places where devices have less space for connectors. Power cord, PCGP11055WT20, Valueline, 2x0.75mm2, 2m, europlug - IEC-320-C7, straight plug, white, PVC Power cable PCGP11055WT20 from Valueline with euro plug and connector IEC-320-C7, section 2x0.75 mm2, length 2m, PVC insulation and white color. This power cable is suitable for connecting mains-powered devices to a power wall socket. Especially convenient on places where devices have less space for connectors. Lan cable, category 6, crossed, 2m, RJ45 to RJ45 LAN cable category 6 with length 2 m. Suitable for office networks with capacity up to 1000 Mbps Ethernet. Lan cable, category 6, crossed, 5m, RJ45 to RJ45 LAN cable category 6 with length 5 m. Suitable for office networks with capacity up to 1000 Mbps Ethernet. Coaxial cable, RF male to RF male, 3m Coaxial cable for connection between two devices with female RF connector. Stereo jack plug, 3.5mm, angled 90° Stereo jack plug with 3.5 mm contact diameter and 90°-angled contact. Stereo jack socket, 3.5mm with switch Stereo jack socket for PCB mounting with 3.5 mm contact diameter and switch. List Price 1.60лв. VAT Incl. 1.52лв. VAT Incl. 1.44лв. VAT Incl. List Price 1.70лв. VAT Incl. 1.61лв. VAT Incl. 1.53лв. VAT Incl. Outdoor DVB-T/T2 antenna, LTE filter DVB-T/T2 outdoor antenna for TV with crystal clear pictures. The antenna has a built-in UHF/VHF LTE filter for better signal receiving. Cable HDMI/m - HDMI/m, 1.5m, black High quality HDMI cable (male / male) with length 1.5 m, gold-plated contacts and support for 4K resolution and 3D. Connector Jack 3.5 mm/m - 2xRCA/f Connector: RCA / m - 2xRCA / f NEDIS. Suitable for transmission of audio signals and others.